Remove the shells from the langoustines and keep the tails chilled. Sweat the vegetables in olive oil. Add the crushed heads and continue sweating. Deglaze with the white wine. Reduce until dry. Add water to just cover and cook for twenty minutes. Pass through a sieve and then reduce by 3/4, whisk in the cold butter and keep warm. Make a cauliflower cream with the cauliflower, sliced onion, milk and cream. Cook for twenty minutes. Season with salt and pepper. Press through a sieve and keep hot. Cut the broccoli, white cauliflower, orange cauliflower and violet cauliflower into small florets. Cook in boiling salted water and season with the vinaigrette. Cook the langoustines in olive oil in a non-stick pan adding salt and pepper. When they are cooked, grate the orange over the hot langoustines. Arrange the langoustines nicely in the centre of the plate with a spoonful of the cauliflower purée, scatter with the various coloured florets. Grate some of the remaining raw broccoli and cauliflower to make multi-coloured confetti to sprinkle over the plate. 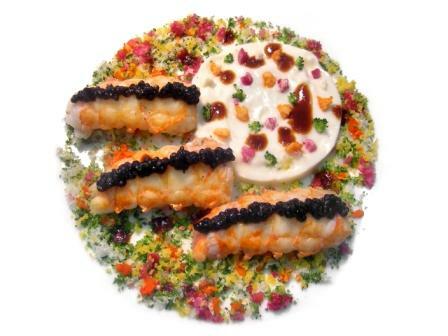 Place the Aquitaine caviar on top of the langoustines and drizzle everything with the sauce.